We've been busy during our 3 day stay-cation! The front porch needed an update, so we've been working on that. The front door used to be painted a traditional black with a brass kick plate. I liked it, but it's very hard for a wreath or arrangement of any kind to show up on the front door. We live in the middle of the woods also, so it's very shaded around the house and I wanted to brighten things up a bit. I've noticed the latest in design is to have beautiful pops of color on front doors. So... I got brave and picked out something I thought would look good with our house. 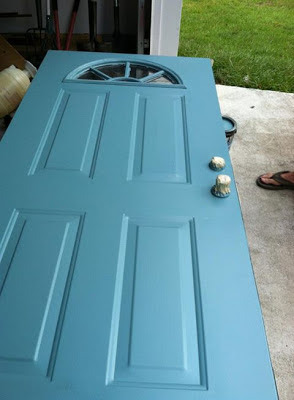 The door is painted in a Martha Stewart Living color called "Hosta". We had it mixed for a satin finish instead of gloss or semi-gloss. The old paint was a gloss and I never liked it. I think the satin will hold up well and it looks so much better! We only needed a quart, but they didn't have the base we needed in that size so they gave us a gallon for the same price. That works for me! I'm sure I can find some other things to paint that color ;) We also got a quart of paint for the trim around the door. It never quite matched the siding before....it looked more green. Our vinyl siding is a tan color. We have white vinyl trim and the shutters are black. This isn't the greatest of pictures, but you can see how plain it looked....and the shiny front door! Yuk! 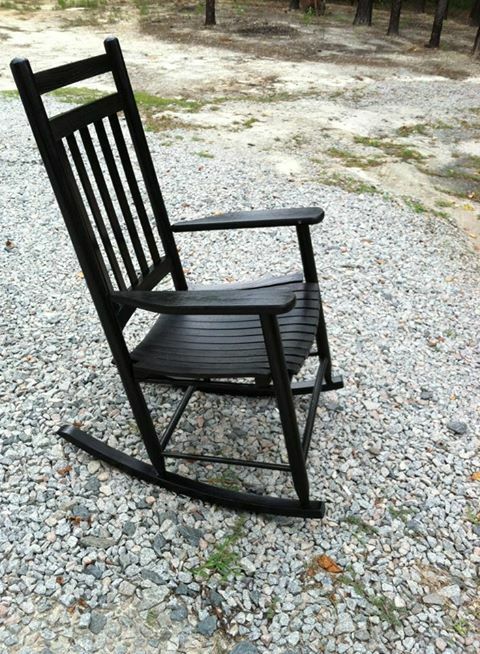 While we were at it, we also gave the rocking chairs a fresh coat of black paint. They look so much better! Now if I can just keep the water sprinkler from hitting them! So here's the color combination for the house now. I started to go with a color that had a little more blue, but decided that would be too safe. I wanted something a little unexpected this time. So off came the door and a sheet was tacked up to keep the bugs out and the cool air in as much as possible. I have to say it worked pretty well! I didn't see the first bug in the house afterward! When Scott got ready to paint the trim, we tacked the sheet on the inside of the door. Scott sanded the door first to knock the ugly shine off. He taped the door handle, kick plate, and inside edge, and got to work. Isn't it a beautiful color? This is the rocking chairs and small table before we painted them. I know. They look horrible! This is what a sprinkler can do to your furniture, people. The furniture on the porch is not exposed to the elements, but over time being sprayed by water...well, it'll do this. We've been here for a little over 4 years now and should have already repainted them. Of course, it was a gradual process. They just really started looking this bad in the last year. Well, here's what the front porch looks like now! We're hoping to install a storm door in the near future that will allow us to let more light into our foyer and living room. I'm sure that will change the look somewhat. Also, I normally have a wreath or something hanging on the front door, so that will also soften the look. Right now I'm working on a burlap wreath....can't wait to see how it will look! I bought two chair cushions for the rocking chairs at Home Depot and two small plants with white blooms. I don't really have a green thumb, so I hope they survive a while! I love the striped fabric and that it has the same shade of blue in it. Since we had extra paint left from the door, Scott painted this little table to match. I'd like to have two seating areas on the porch. I want to put the rockers and the small table on one end and a swing or small bistro type table/chairs on the other end. Then I'd be able to spread out the blue color to make it more noticeable from the road. Well, there you have it. A simple upgrade using some paint and a couple of cushions and plants. I'm looking forward to more evenings on the porch listening to the sounds of crickets and frogs while we try to solve the world's problems...lol! Thanks so much! It's really brightened up the front of the house! I love a front porch (I don't have one), and you did a great job adding color and clean lines to yours. I like it! What a great update! Love the color you chose--so cheerful and fresh but still lovely and classy. And a gallon for the price of a smaller size? Sounds like a great deal! Good job! Thanks Richella! I love your front porch! I wish I had that much space on mine.